At a time where it seems trouble and struggle overwhelm us at every turn, it is necessary, dare I even say critical, to find a symbol in which we are able to hang our hope upon. Without it, we are left to wander adrift in the darkness and pain with eternal sorrow because there is no way out. Finding hope is essential and intentional. 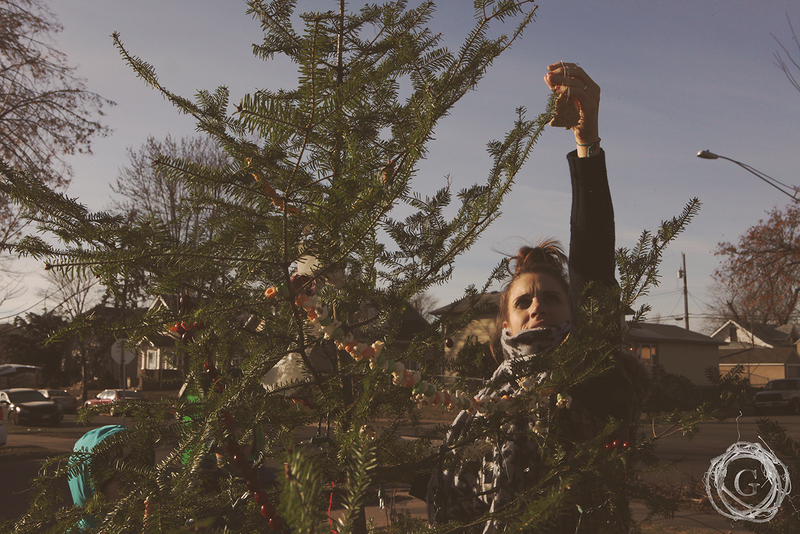 This past week, Gatherhaus created a Woodland Edible Garden Christmas Tree. We put it up in the community garden that was site where the 2011 tornado hit North Minneapolis. Where a home with a loving family used to stand, then sat vacant, empty and dark. This past year it was turned into a thriving community garden that nourished the community and brought neighbors together. But even in the midst of its purpose, in these cold months of winter, it sits empty, barren and dark. It physically represents on the outside what many of us feel on the inside. But we had an idea. What if we put an edible Christmas tree for the animals right in the middle of this space? A beacon of light in the midst of the dark lot and dark corner. A source of food when it is hard to find. A small billowing beacon of light, unexpectedly where no light was before? I love this idea, especially because of its dual purpose. Light has a way of reaching into our spirit and warming us from the inside out. It’s purpose is to break apart the darkness. Both symbolic and representative in nature. Living on the Northside, I have a very real and personal encounter with this project. The garden sits right next to our home and for the last week, every time I come home, and that tree is lit, I feel its warmth. A smile spreads and in a way that nothing else this holiday season has done, it gives me hope. This lot is now home to a slightly off kilter christmas tree with a broken top, wrapped in a string of lights. It’s slightly homely, mostly Charlie Brownish, and yet, because of its lack of brilliance and spectacle, it shines even brighter to me. It represents not only how I see myself, but also our community. A little wounded, slightly broken, but not lost. Still it shines even as it wars with the wind to stand up right. it is a symbol of hope in a dark place. The other piece in this project completes our circle of simplicity and purpose. It is a way to care for our furred friends, to nurture nature and remember our role on our planet. Kat and I started this adventure with a trip to Mother Nature Tree Farm where we claimed a simple and thin Free Range Organic Christmas Tree. Basically, these trees are cut down far north of here to create a fire break, and rather than just dispose of them, they are given a second life in the tree lot. Back at the garden plot we spent about an hour trying to figuring out how to keep our tree from falling over. Placed in a bucket filled with rocks and water (to turn into ice) we held up the bucket with other larger rocks and planters. The tree had experienced a momentary hardship on the way home, and acted as a sail before we hit the highway. We were able to hold onto it, but noticed the top has snapped and broken when we got home. No worries! We tied it back on with festive fabric! 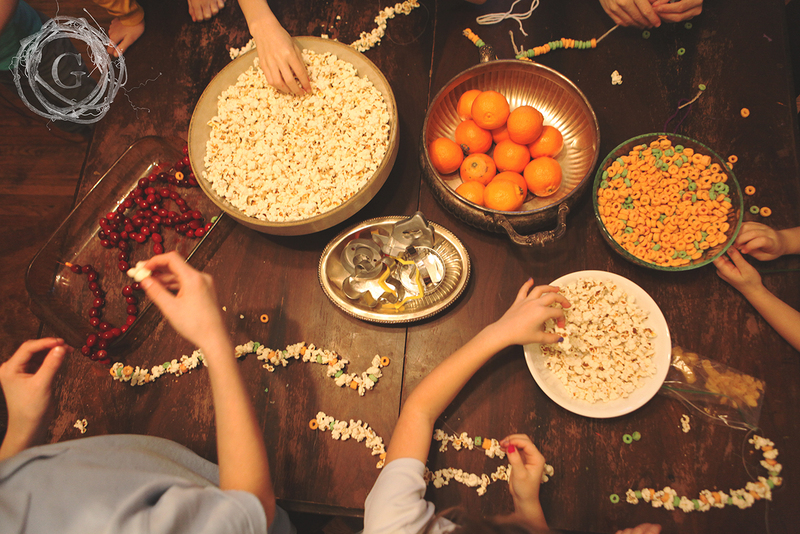 Popcorn string – It’s best to have each strand started so when the children tire of the project, the strands are mostly finished. Cereal strands – This can be any type of cereal. We liked the large loop ones so that that younger children who can’t use needles yet can participate as well. Again, have the strands mostly done so they kids don’t wear out too soon. Cranberry garland – not sure the animals are going to eat this, but it adds a splash of color and will decompose when the tree is done! 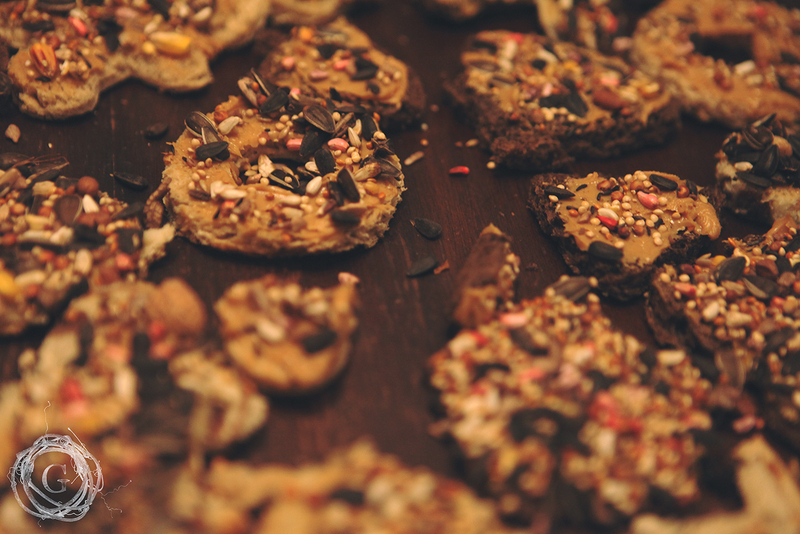 After all the garlands were done, we had the kids cut bread out with Christmas cookie cutters, paint them with Peanut Butter and sprinkled them with bird seed. 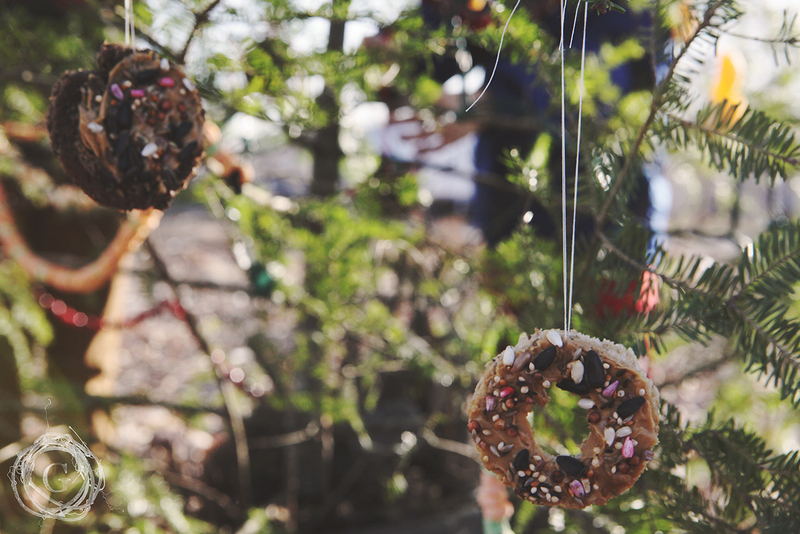 We let them dry out for a few days then tied them up with string, and hung them on the tree. Painting pinecones with PB also works and rolling them in bird seed! Peeled oranges also make a wonderful garland or individual ornaments, while also adding a splash of color. I am sure a simple search or a few moments on Pinterest would provide dozens of other edible ornament ideas. We enjoyed the few we did and the simplicity enhanced its beauty. The next morning, my children and I looked out our dining room window and saw a half a dozen squirrels running around the tree, climbing up and feasting! 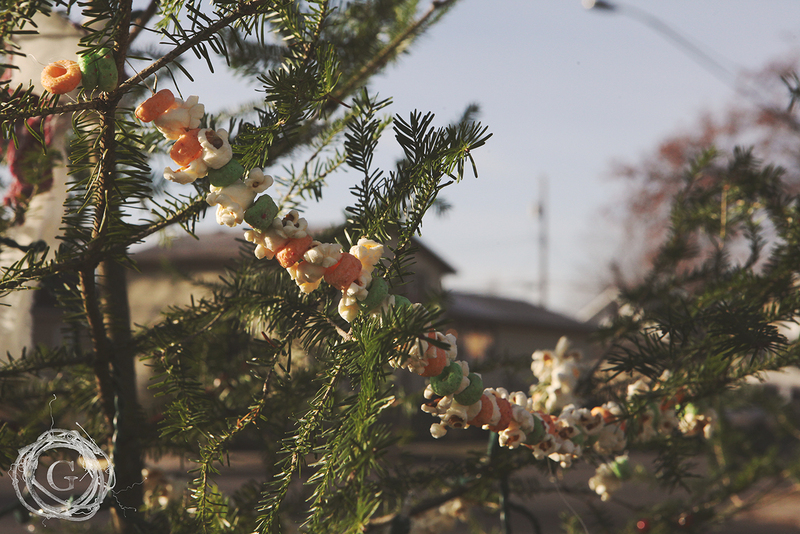 We also saw crows perched on the branches and pecking at the ornaments. It was such a joy to see my kids faces light up at what they did for their garden friends! 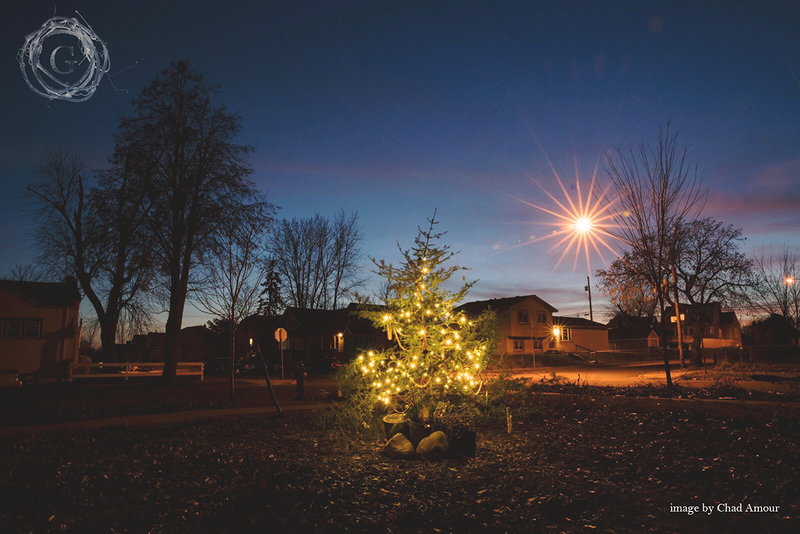 In the midst of putting up and decorating the tree, a few neighbors stopped and we got to talking about the tree. They lit up at hearing what we were doing and my happiness expanded as their joy was contagious. “What a wonderful idea” they said. “We need more of these” another said. “I will have to walk my kids by here” said yet another. A symbol of hope. A place for us to care for our neighbors and animals together. An unexpected piece of joy in an otherwise dark corner. It is incredible how something so small and simple can bring actual joy and represent what we all long for in our lives. It’s what Christmas is. What it means. Why it is more rare and special than any other holiday. It connects us to the reality of our need for Hope and Light and Life in an otherwise dark and desperate place.